After space planning is finalized, we dimension floor plans and develop elevations. ELEVATION: a geometrical drawing that depicts one vertical plane of an object or structure. In layman’s terms, it’s like looking at a wall in flat plane. CONSTRUCTION DRAWINGS: Construction drawings go beyond just the floor plans that the builder uses. They can also include technical drawings that are used to build custom details like built-ins, cabinetry, trim work, and stair systems in your home. You can see an example of some elevations and construction drawings in this Manchester Hills renovation. The yellow, orange, and green elevation of the fireplace wall gave details about the various finishes that then correlate to finish specifications for interior and exterior. The Fuchsia Design team is well-versed in cabinetry design. We layout cabinets and built-ins for any space in your home and develop the drawings needed for them to be built. 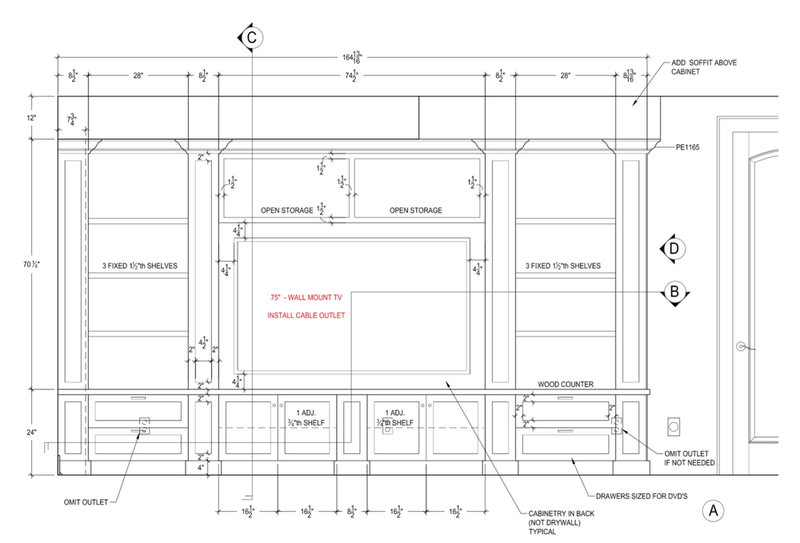 The custom entertainment unit drawings below provided information to the cabinet maker regarding materials, finish, sizes, dimensions, and electrical. This Heritage Hill Renovation is another great example of floor plans, construction drawings and elevations. In addition, the space planning shows how we explored different layouts and ultimately decided on the one that was built. Nadia is in charge of all of our amazing elevations and construction drawings. Check out more about her expertise here!